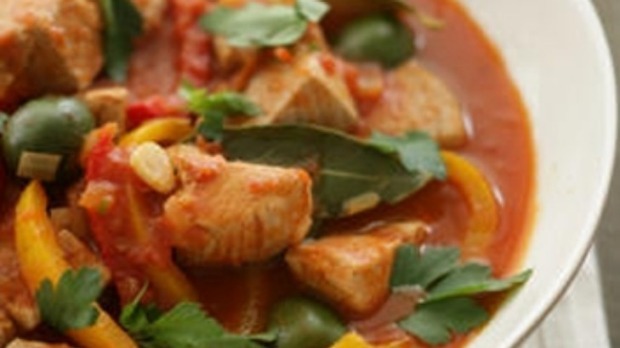 This fresh tuna stew teams fresh fish with red capsicum, chilli and paprika. The Marine Conservation Society suggests albacore tuna is a more sustainable choice than southern bluefin. Cut the capsicum into strips, discarding core and seeds. Heat the oil in a frying pan and cook the onion and capsicum for 10 minutes until softened. Add the chilli and garlic and cook for 2 minutes. Add the white wine and allow to bubble and reduce. Add the tomatoes, stock, bay leaves, paprika, olives, salt and pepper and simmer for 15 minutes. Cut the tuna into 2cm cubes. Slip the tuna into the stew and simmer for 5-10 minutes or until tender. Serve in warm pasta bowls with lots of parsley.